Road he made two under-21 appearances for Wales, both in 1991 against England and Poland. Two years later he came on as a substitute for Neville Southall to gain his first full International cap against Eire, winning a second cap in 1997. After playing 122 League games in 11 years at QPR, he moved across London to the New Den where he spent a season playing for Millwall. 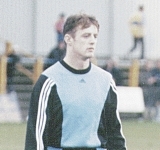 Welshman to gain caps at Pro and Semi-Pro level when he played in the game against England at Rushden in February 2001.